Delaware State’s scholarship numbers nearly came back to bite Florida State’s bowl eligibility. 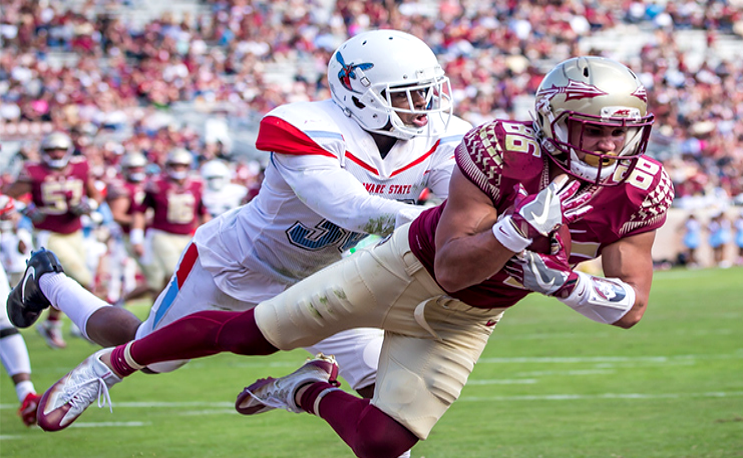 Florida State’s money game blowout of Delaware State nearly cost FSU its shot at a bowl game. FSU’s 6-6 record barely made it bowl-eligible this season, but its 77-6 money game blowout of DSU on Nov. 18 should not have counted towards that total. Wins over FCS teams only count towards bowl eligibility for FBS if the lower-level teams award 90 percent of the FCS scholarship maximum. A Reddit user’s research found that DSU’s average grant-in-aid for the rolling two-year period was just under 55 scholarships or 87 percent of the FCS scholarship max. Three teams in the FBS with six wins, Buffalo, Western Michigan and UTSA, were ineligible for bowl games because one of their wins came against opponents who did not meet this criteria. Apparently, no one bothered to check FSU, save for the Reddit user. It will still get to take on Southern Miss next Wednesday in the Independence Bowl. While the situation is no skin off DSU’s back, it’s definitely worth watching from an HBCU perspective. Teams who bring in HBCUs and other FCS schools for money games will likely be vetting potential opponents more closely to ensure they don’t find themselves shut out of bowl games due to opponents who fall short of the 90 percent cap. Delaware State ends Savannah State basketball's time in the MEAC.